The story follows an unusual assortment of mismatched characters, each coping with the impending end of the world in his or her own bizarre way. 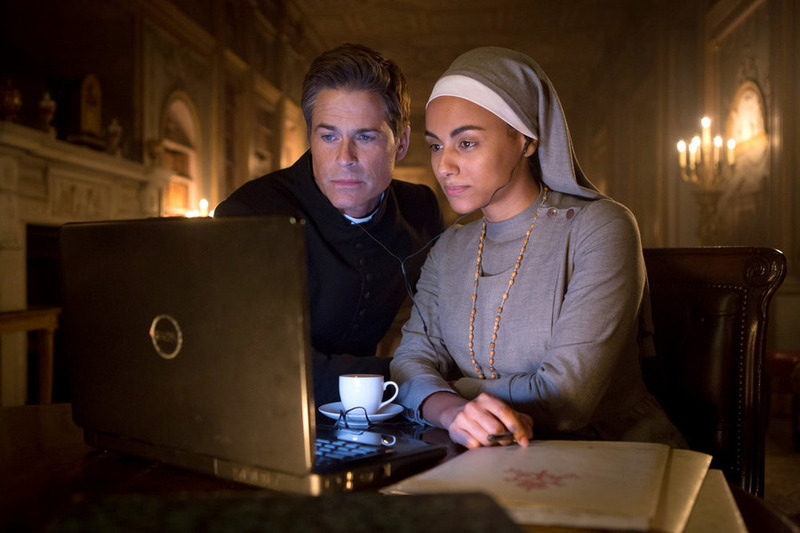 Perhaps the most complex is Father Jude (Rob Lowe, “Parks and Recreation”), a rebellious and foul-mouthed priest who is tasked with being the “devil’s advocate” with the aid of his new timid assistant, Sister Celine Leonti (Gaia Scodellaro, “Cugino e Cugino”). Rhonda (Jenna Fischer, “The Office”), a mild-mannered librarian, finds herself dangerously out of her depth when she is sent to a maximum security prison for a crime she did not commit. She unwillingly befriends Leanne (Megan Mullally, “Will & Grace”), an unhinged white supremacist who takes a deeply reluctant Rhonda under her wing. Morally dubious, but intensely loyal, Leanne is a woman uniquely suited to surviving the end times and will prove herself to be exactly the sidekick Rhonda needs. OHSOGRAY attended a recent press call for You, Me and the Apocalypse, where star Rob Lowe and creator Iaian Hollands discussed what they’d do if the world were coming to an end. If our world was coming to an end, do you think our leaders would be as honest about it as in You, Me and the Apocalypse? Rob Lowe: I always thought and Iain probably can give the real answer since he wrote it. But I always thought they absolutely kept people in the dark in the world of the show and probably for a long time, they knew it was coming. Now when it got to 30 days out, they were like, “You know what? At some point we have to let them know.” I bet you they knew the world was ending for a lot longer than 30 days. But if this any indication, I think ignorance is probably bliss. Iain Hollands: I agree with Rob. And on a personal note, I would far rather not know then know. For Rob, I was wondering with 30 days left, what would be on your bucket list? Rob Lowe: I spent a good amount of time thinking about that during the show. While there may be a couple of things you know that you’d consider. I’ve never been to the Rain Forests or whatever. When really faced with it, I would want to do exactly what I’m doing, which would be work hard, be with my family and live the life I’m living. It actually makes me feel really good and satisfied about – about my life. I’m blessed. It’s all good because I don’t feel like there’s a lot of stuff out there that I would feel like I missed out on if it was all coming to an end. Rob Lowe: It was sent to me. The minute I read the first Father Jude scene, I knew I was in. There aren’t many scripts that grab you like this because Iain did such a great job in terms of tone of it being very, very dramatic and very, very irreverent and witty all at the same time. The character of Father Jude in particular for me was a standout. Certainly nothing like anything I’d ever played before. This is the first time that you played a priest. Did you have to find a different sort of headspace to play that character? Rob Lowe: Well, it was a great excuse to do something that I’ve been putting off forever which was really, really, really spend some time reading the bible cover to cover. I’ve read bits and pieces of it over the course of my life. But I never really sat down and taken it all in in a sort of scholarly way. So, that was great, a great opportunity to do that. In terms of playing a priest, for me, it was like there are certain archetypes that an actor should play before they you know move on. Cop, check. Cowboy, check. President, check. Priest, check. So I’m working my way down the list now. How do you juggle the time between this series and The Grinder? Rob Lowe: It is really exciting. Two completely different characters in two completely different types of shows on two networks at the same time is really for me sort of an actor’s dream. We had finished – I would travel back and forth. I’d do three weeks in Europe on You, Me and the Apocalypse and then I would fly back here and work on The Grinder. So to do it – not only to be doing them both at the same time was a challenge, but also really fun. Then we finished Apocalypse in a time where I could then really do the meat of The Grinder, which I’m still doing today. For Iain, is there one of these characters in particular that you enjoy writing for? Iain Hollands: It’s a show with a lot of characters. We spend an awful lot of time trying to structure it in a way which allowed everyone to have some fun with their character. I don’t think I have one in particular. I think it depends on what mood you’re in. Like if you’re in a foul mood, it’s fun to write Leanne. If you’re in a – in a kind of pessimistic mood, it’s often to better to write some of the British characters. I don’t have one in particular. But writing Father Jude was certainly – that was a lot of fun because he’s a – he’s you know on the surface, yes, okay. He swears and he smokes and everything. But what was really interesting was there’s real depth to him. You scratch the surface and he’s a man that really cares and who has the real courage to take on hypocrisy. Okay, he does it in a really reverent way but I love writing somebody that had you know really cared about their face that much. 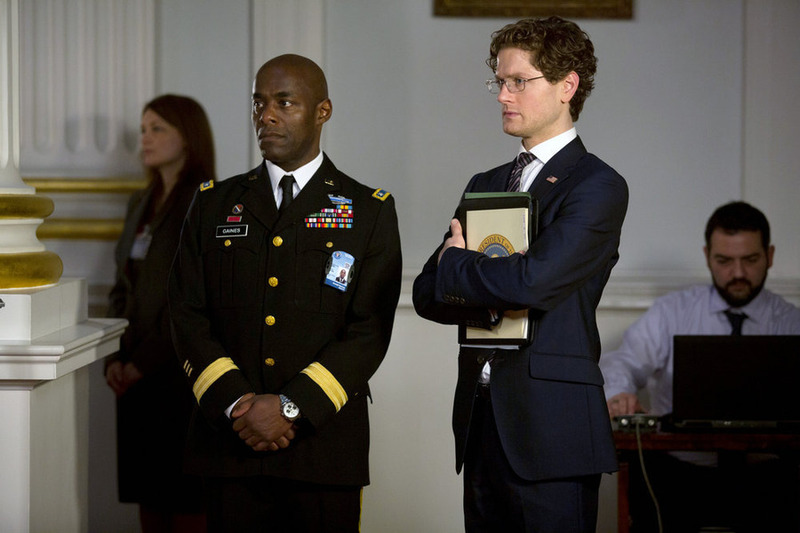 For Iain, is it easy to write for both British and American audiences? Iain Hollands: Yes. I mean I don’t think you consciously set out to do that. The only thing you can really do is write something that you’d enjoy watching. I think the fact is now that we watch so much TV over here from America, it’s such a great you know period of – there’s so many great shows around. But you kind of pick it up almost by osmosis. So, from that point of view, it wasn’t difficult. I mean there were – its like when you’re sitting down and reading through the scripts with American actors. You can tell where you’ve gone wrong with the words they wouldn’t use or intonation that they wouldn’t do. But generally speaking, I think that British and American audiences are more – have more similarities then they have differences. With the show being 30 days until the comet collides with earth, if you get more than one season, how is that timeline going to work? Iain Hollands: Yes. I’m trying to think how to answer that without giving anything away. But it’s – there’s definitely a possibility for it to return. There’s a plan for that to happen. But it’s difficult for me to answer your question without a massive spoiler alert. So just to say that the end of the final episode isn’t necessarily the end. Rob, as far as being the devil’s advocate, what kind of scenarios are we going to see you play that in? Rob Lowe: Well, the – as the world unravels, the church teaches that would be not only the time for the savior to return but also the time for the antichrist to return if it is indeed the end of the world. When we realize it is the end of the world, you need the devil’s advocate to sort out and find the antichrist, the real one or the real savior. So he’s a busy man. I think up until the show opens with the announcement of the media, I think the job of devil’s advocate was probably not as exciting as it sounds. But the minute – the minute the apocalypse is on it, all bets are off. 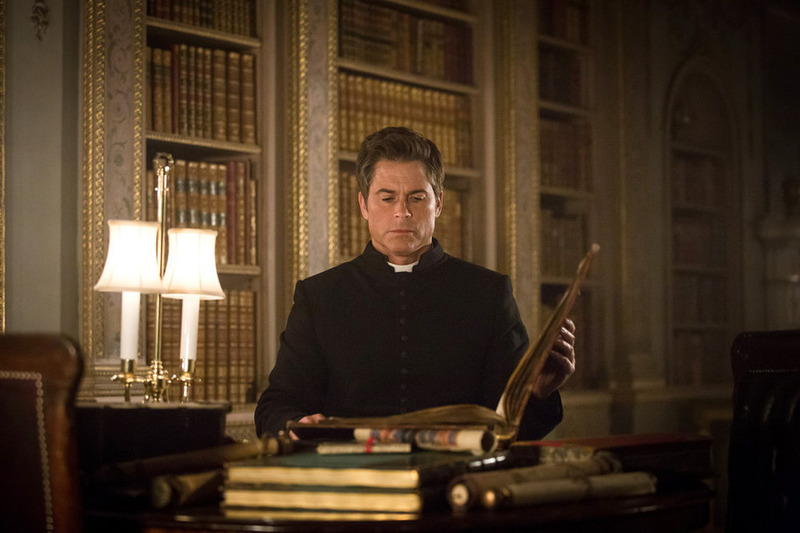 What’s it kind of been like going from playing a character like Parks and Recreation’s Chris Traeger to a devil advocating foul mouth priest? Rob Lowe: Great is the answer. If I could design my career which we all try to and sometimes you can and sometimes you can’t. It would be going from one extreme to the other with each role. So, this was the perfect tonic for me right after playing Chris who’s such a beloved character. People love and I loved playing him. But I was definitely ready to exercise my more what’s the word I’m looking for? Misanthropic muscles. Megan Mullally is also on You, Me and the Apocalypse. Rob Lowe: I didn’t recognize her. I’ve known Megan since 1984. She’s a chameleon. She’s an amazing actress. I mean I think that’s no surprise. Everybody knows what a stunning actress she is. When she was on Will & Grace, people thought that’s who she was. Literally, they thought that was. Then when she was on Parks and Rec as Tammy, she just inhabits those characters. This is no different. But, I think even Megan Mullally fans when they see her in this at first probably won’t even realize it’s her. Iain Hollands: Yes. I have to say. I mean she was amazing. She was so brave. She was the one that wanted to push it further and further and further. It was – it was – I think when you first offer a part like that to an actress, you’re always kind of worried that they’re going to want to look amazing. She was the one was like, “No. No. No, I want the teeth. I want the hair. I want the full works.” So I think that was a really bold step for her to make. The Rhonda character, Jenna Fischer’s character, with her being in prison, it has a sort of Orange is the New Black kind of feel to it. Can you talk a little bit about her character? Iain Hollands: So Jenna Fischer plays Rhonda who – who has been wrongly accused of a crime and in prison. She’s kind of like a mild mannered librarian, completely unable to deal with life in prison. Then kind of weirdly luckily for her, the apocalypse is coming. There’s this huge prison break, which she manages to get away which is fantastic news. But unfortunately, she lumbered with Leanne, Megan Mullally’s character who’s the kind of person that should would in normal life cross the road to avoid. And kind of their story is the story of two women desperately trying to get across America to be with their families before the end of the world. For Rob, your name triggers a lot of memories of the greatest TV shows. If the end of the world is coming, who do you want to be remembered as? Rob Lowe: Wow. Great question. Thanks. I mean, I would like to be thought of as a father first. My two sons are amazing young men. I’m very proud of them. One of them is on The Grinder now as a reoccurring actor as he’s getting a 4.0 at Stanford. My other is graduating Duke and going to law school. They’re great human beings. That’s way more important than anything I’ve ever done in my career. Then I just think that – that as you allude to, different people have different connections to me. Some are recent. Some go back 30 years. I think it would be an incredible legacy to be one of those people that has been relationship with an audience their entire lifetime. What would the two of you do if the end of the world was coming in the next 30 days? Rob Lowe: Iain, why don’t you take this one. I want to hear what you want to do over there. Iain Hollands: I think I’d probably have to start a list of all the many people that I’ve irritated and done wrong by over the years and start working my way through. I don’t know how far I’d get. But you know I’d hope to make it down to the end of page 1 maybe. Rob Lowe: Yes. And for me, I would kind of – it’s funny. I wouldn’t want to quit my job if the end of the world was coming. I understand why do it. No one’s going to be around to see it. But, it’s interesting. As I’m not sure I would change much about my life other than I would make sure that I would get my kids out of school and make them come home so we could all you know be together. But, you know I would keep on trucking. For Iain, do you know any of the characters personally that you wrote about? Iain Hollands: We – oh, we first pitched it about 5 years ago. I wanted to write a show about the apocalypse, but where the apocalypse was weirdly the best thing that could have ever happened to all these characters. So, when you first meet them, they’re all trapped in some ways by their kind of everyday worries. Then weirdly, the knowledge that the world’s ending allows them to free themselves from the things that have been holding them back and just concentrate on what really matters. So, I mean that was kind of my starting point. It took a long time to – I mean it’s a British show. So we start it off, we had to get a British network on board first. Then NBC came onboard later. So it took quite a while to get everything together. I don’t particularly – I haven’t based any of the characters on anyone particularly. I mean I think the character of Jamie is probably the closest to me in a very British way. He dithers quite a lot. He’s not as proactive as Americans tend to be. Tend to be you know very heroic and know what to do. Whereas, I would just have no idea whatsoever in that situation what the best thing to do would be. So, yes, I think he’s probably the nearest, nearest to me. If you could just bring out one message to all of your fans and all of the viewers of the show, what would that be? Rob Lowe: Well, I think, let’s see. I would say that I would describe the show to the fans as a – let’s see, a boundary pushing comedy drama that presents the end of the world in a way that you’ve never seen before through extraordinary drawn and interesting characters with plot twists that you will absolutely never see coming. Rob, you mentioned earlier in this conversation you had read the bible pretty much in its entirety which you had not done before. What did you get from it that you probably didn’t know before or didn’t understand before? Rob Lowe: Well, I mean honestly, every time I do any reading, I’m kind of struck with the same thing really other than you know if you’re looking for guidance, then obviously you get different things from it depending on what you’re looking to have answered. But overall, I’m just always struck with the language. It’s so beautiful. I’m also struck with things like how many common phrases we have in our everyday casual vernacular that comes from the bible. You’re like, “Oh, that’s where that comes from?” So, you know it’s just – I’m not breaking any new grown when I say it’s such a work of depth and inspiration and beauty that I’m kind of amazed each time I open it.